A quick blog post today… (off doing secret squirrel stuff.) I wanted to post a pic of how I set up my table at my events. 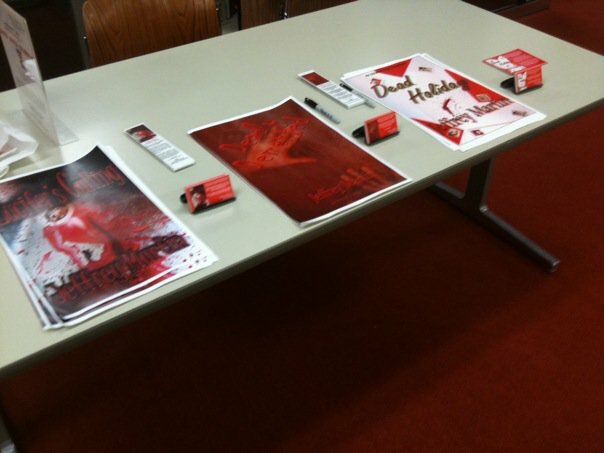 A few weeks ago, we talked about preparing for an author event. Today, we have footage of how it actually looks… Pay close attention to the breath mints. They become a very important tool, if you have too many frappucino’s… See you next week. 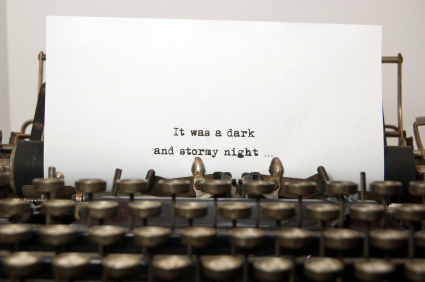 I’m more than halfway through the writing process for my next novel, 3:16. With that in mind, I thought you might like to see an excerpt from it as it unfolds. In this scene, two of the main characters meet for the first time. Enjoy! Brandon Thornley pushed himself away from the desk. Donovan was surprised how chiseled the security director was. Stronger and leaner than me. Brandon stood up and reached for the hand of his visitor. The sheer force of the man’s grasp almost caused Donovan to grimace. “No worries. We can put you right back into the thick of things.” Brandon motioned for him to sit. Just killing people. Donovan puffed on the cigar. Test Your Jeffrey Martin Fan I.Q.! 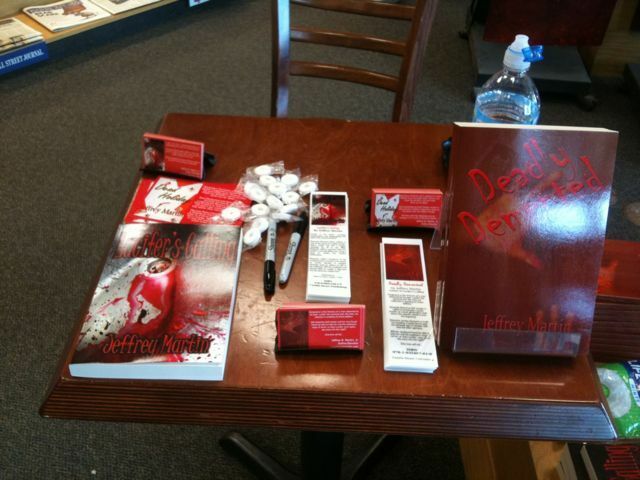 Think you’re a true fan of Jeffrey Martin’s novels and short stories? Take this short quiz! 5. In House of Misery, what was in the window on the second floor that caught Brooke’s attention? Want to check your answers? You’ll find them posted on my Facebook Fan Page. Click here to go now! 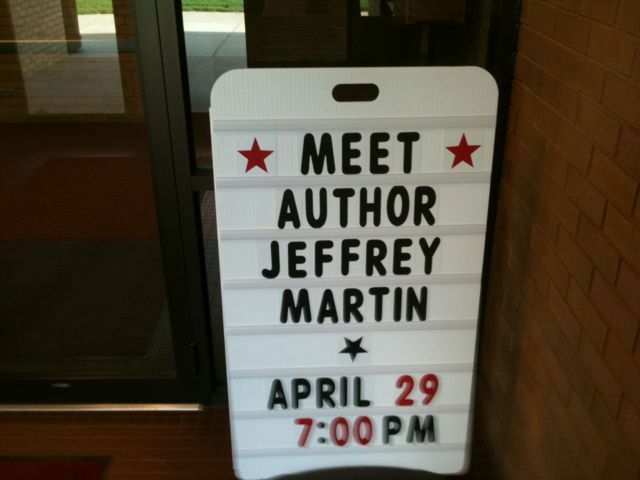 5 correct: A true fan of Jeffrey Martin, you’re anxiously awaiting his next book, 3:16. 4 correct: You’ve read them all…but the quiz is a little tricky! 3 correct: There might be a story you missed, but you love visiting the blog. 1 correct: Time to go to Jeffrey Martin’s Amazon Store. 0 correct: Make sure you click here for a free read of his work! So, you have spent months using your right brain to create a wonderful book, and you’re fortunate to have it in the marketplace, but your publisher’s budget doesn’t (notice how I italicized the word doesn’t) include all expenses paid book tours throughout the country. How do you get the word out and get the opportunity to speak face to face with your fans? Well, you could SKYPE all the fans you have on your various social networking sites and have personal, one-on-one communication with them (I don’t recommend that), or you can scour the list of local bookstores and libraries in your area and see if they would be interested in having an author event. (I do recommend this idea.) Sometimes it can be difficult for a new author to find venues, so don’t be discouraged if they tell you no. What I usually do is ask them if I can send an email attachment about me and my work. This packet contains items like book synopsis (back cover blurb), a biography of the author with a picture, the vendor who your books can be ordered from, publisher point of contact information for bookstore discounts, and merchandise info (t-shirts, pens, posters, etc.) and the website link to purchase it. Thank them for their time in reviewing the material. After the bookstore/library decide they want you to attend the event, (thank them for the invite), it’s time to market. The store or library may have a small budget, just like a publisher, so take it upon yourself to have a marketing strategy. I have several online locations where my marketing guru will post each event. I suggest using the major social networking sites to promote the event. I also would urge each writer to have a website dedicated for their books. Domains are rather inexpensive, and if you are hoping to make writing a career, you’re gonna need one (I will talk about various reasons why in future blogs). An easy way to market yourself is to create a business card. A little blurb on the card to peak reader interest, plus your current e-mail/website information is also important. People may want to contact you after they read your work, and having this information up-to-date will make it easier for them to do so. For every published work I have, my idea is to have individual business cards bookmarks made up with the cover of the book and, of course, a blurb readers will enjoy. After you think you have marketed the event the best way you can, confirm with the bookstore about a week before the event. Make sure they have books in stock, or they have you order them in time for the event. Some bookstores/libraries will have the author order the books because of other circumstances that dictate this. (Oh, believe me, this will be covered in another blog, as well.) I again thank them for the invite. Remember when Mom and Dad told you to say please and thank you? This goes a long way with managers and bookstore owners. Okay, the books are in stock, you’re confirmed for the event, you have passed out more business cards in the last few months than ever your life, so are you done? Today is the author signing. You start the day a little nervous but focused. Go ahead and pick out something comfortable to wear for the event. For me, I like to walk around the store, shake hands with people, and pass out business cards, so I enjoy wearing relaxing clothes, where I can move freely and not worry if my Frappichino will stain my suit or not. Once you’re dressed and are ready to walk out the door, make sure you have everything you need. I also like to stop at the store and pick up some mints to pass out, as well. Fresh breath will make you lots of friends. Plan to arrive with plenty of time to meet the bookstore contact. Again, thank them…do you see the pattern? Lol. If they have a table ready for you, great; if not, ask them if you could be close to an entrance where people can see you and your bowl of mints (People like free candy)…I meant books. Set your table up with all of your marketing items. Again, mine include bookmarks, business cards, mini posters of my book covers, and postcards. Have a guest book available for people to leave their email or mailing address, so they can be informed when you have another book coming out, other events in the area, or maybe they are writers and want some advice from you. Okay, the table is set up, people are stopping by to get free mints, and start asking about your book. This is the time to show your passion for the work you created. Maybe read a few paragraphs from one of the books (something that will invoke interest, obviously). As you open up to people and others around you start to hear your confidence, they will want to stop over and see what’s going on. When the dust clears, hopefully you have many people added to your mailing list and have sold some books. Then, it’s time to clear your area, and make sure to again thank the event coordinator/librarian/manager. Want to see one of my signings in person? 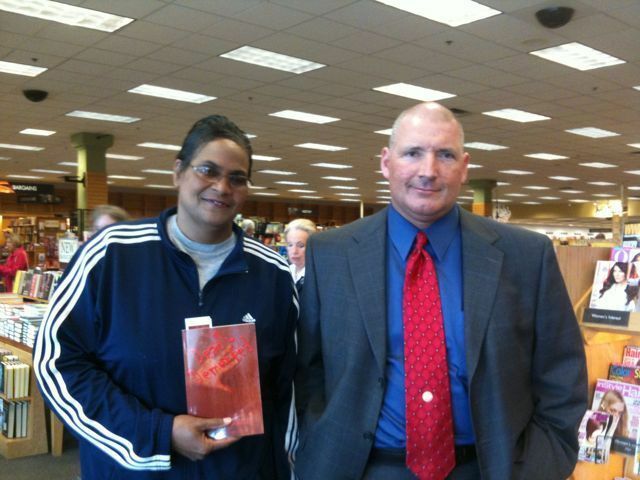 Meet me on Saturday, May 8, at 1:00 at Borders Books & Music in West Des Moines. Thanks, to the ladies at The Carroll Library last Thursday. I had a great time and look forward to coming back in the near future.